MSE Foundation Disclaimer This Website is an educational and informational service provided by Millennia Scope Entertainment Foundation, Inc., (MSEF) with the express condition that users agree to be bound by the terms and conditions set forth in this User Agreement, as they may be modified from time to time. Your consultation and use of this Website constitutes your acknowledgment and acceptance of all of the following terms and conditions. You acknowledge that the information on this website is provided “as is” for general information only. MSEF, Inc. makes no representations with respect to the information, services, products or message on this Website and specifically disclaims any other warranties, including but not limited to implied or express warranties of merchantability or fitness for any particular usage, application or purpose. MSEF, Inc. makes no warranties of any kind regarding the operation of this website, including but not limited to any warranty of accuracy, completeness, currency, reliability, merchantability or fitness for a particular purpose, or any warranty that these pages, or the server that makes them available, are free of viruses, worms, Trojan horses, other harmful elements or other code that manifest contaminating or destructive properties and such warranties are expressly disclaimed. Links from this Website MSEF, Inc. makes no representation, warranty or endorsement, express or implied, as to any of the information, services, products or messages on any other websites, which may be accessed through a hyperlink on this website. In particular, these links are provided for convenience of reference only and are not intended as an endorsement by MSEF, Inc. of the organization or individual operating the website or a warranty or endorsement of any type regarding the website or the information, services, products or messages posted on or available from such website. Copyright and Trademark Unless otherwise indicated, all information contained on this Website, such as text, graphics, logos, button icons, images, audio and video clips, is copyrighted by and proprietary to MSEF, Inc. The content displayed on any page of this Website may be used for personal and noncommercial uses which do not harm the reputation of MSEF, Inc., provided that the user does not remove any trademarks, copyright and any other notice contained in such content. The name and mark, MSEF, Inc. and its attendant logos and taglines, are trademarks of MSEF, Inc. and may not be used or reproduced without its prior written consent. Liability You agree that you will hold harmless MSEF, Inc. and its officers, directors, agents, employees, and volunteers from all claims arising out of or related to your access or use of, or your inability to access or use, this website or the information, services, products or messages contained in this website or other websites to which it is linked, including but not limited to claims that you have found something you have heard, viewed or downloaded from this website or another website to which it is linked to be obscene, offensive, defamatory, or infringing upon your intellectual property rights. In no event will MSEF, Inc. or the contributors of information to this website be liable to you or anyone else for any decision made or action taken by you in reliance on such information or for any consequential, special or similar damages, even if advised of the possibility of such damages. YOU HEREBY RELEASE AND FOREVER WAIVE ANY AND ALL CLAIMS YOU MAY HAVE AGAINST MSEF, INC., ITS OFFICERS, DIRECTORS, AGENTS, EMPLOYEES, AND VOLUNTEERS FOR LOSSES OR DAMAGES YOU SUSTAIN IN CONNECTION WITH YOUR USE OF THIS WEBSITE. Governing Law This website (excluding linked sites) is controlled by MSEF, Inc. which is headquartered in the State of California, United States of America. It can be accessed from all 50 states, as well as from other countries around the world. As each of these places has laws that may differ from those of California, by accessing this website both you and MSEF, Inc. agree that the statutes and laws of the State of California, without regard to conflicts of laws principles thereof, will apply to all matters arising from or relating to use of this website. You and MSEF, Inc. also agree and hereby submit to the exclusive personal jurisdiction and venue of Los Angeles County, California and the United States District Court for the Central District of California with respect to such matters. 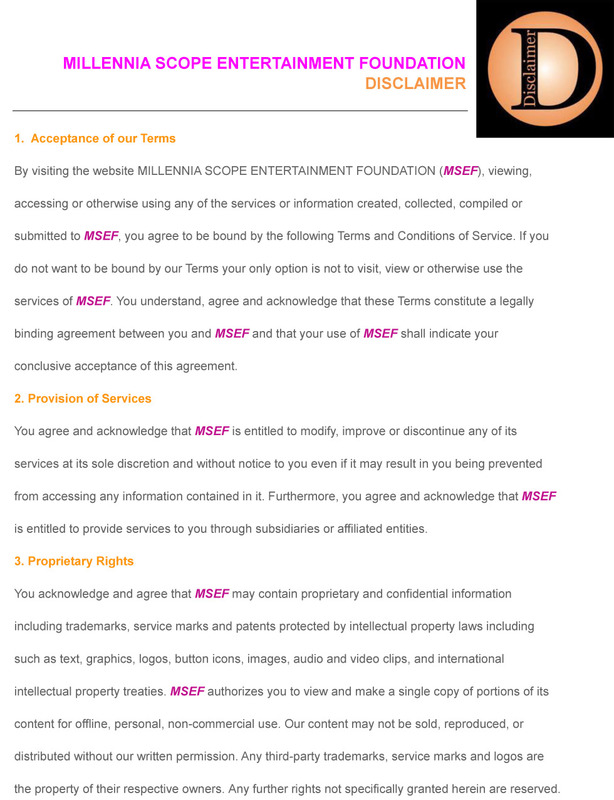 MSEF, Inc. makes no representation that materials on the website are appropriate or available for use in other locations, and accessing them from territories where their contents are illegal is prohibited. Those who choose to access this website from other locations do so of their own initiative and are responsible for compliance with local laws. Linking From Other Websites MSEF, Inc. may grant the owner of a website permission to use a hyperlink to this website from its website, provided: (a) any such link must clearly be marked “Millennia Scope Entertainment Foundation, Inc.;” (b) the appearance, position and other aspects of either the link or the host website may not be such as to damage or dilute the goodwill associated with MSEF Inc.s name and trademarks; (c) the appearance, position and other aspects of either the link or the host website may not create the false appearance that any other entity is associated with or sponsored by MSEF, Inc.; and (d) the link, when activated by a user, must display this website full-screen and not with a “frame” on the linked website. The owner of any website with a hyperlink to this website agrees to the foregoing terms and agrees to delete any such link upon notice from MSEF, Inc. that such permission has been revoked, which notice may be given at any time and for any reason. MSEF, Inc. is not responsible for the information or materials contained on websites linking to this website. Links to this Website are provided for convenience of reference only and are not intended as an endorsement by MSEF, Inc. of the organization or individual operating the host website or a warranty of any type regarding the host Website or the information on the host website.